Bere:architects started in 1994 and from the beginning, the practice has advocated the principles of sustainable development, and applies strict ecological, environmental and sociological criteria to the projects that they undertake. Their work encompasses the public and private sectors, including historic monuments, public amenities, transport buildings, private homes as well as larger social housing developments. They strive to ensure that their urban and rural development projects meet present-day needs, without compromising their potential to meet the needs of future generations. The practice aims to create a bridge between the past and the future, bringing together the historic and the contemporary as far as possible. They bring a craftsman-like approach to all aspects of the building process and their respect for traditional techniques does not hinder them from using modern materials and techniques where their use is sustainable. They take advantage of indigenous materials, techniques, traditions and industries when they can be sourced locally without compromising cost, environmental concerns or the appearance of the finished product. Energy preservation is a key element of sustainable living. It is one of the central principles in bere:architects’ choice of materials and design aesthetics: they combine ecological effectiveness with pleasing forms. All their buildings, both domestic and public, are intended to be exemplars in energy efficiency and to set precedents in sustainable and affordable design. bere:architects are at the forefront of the development of the Passivhaus movement in the UK. Now, as one of the UK’s foremost Passivhaus practitioners and winner of numerous design awards, bere:architects has not only completed the prototype Passivhaus low cost social housing in Wales, but London’s first certified Passivhaus in Camden. The team is also working on other domestic and non-domestic new builds and retrofit Passivhaus projects. Passivhaus demands a particular approach to design and construction, and demands rigorous on-site testing during the building process. To enable bere:architects to deliver quality-assured low carbon buildings, they have developed in-house skills in building physics and use the latest Passivhaus software. bere:architects acknowledge the value of history and location while expressing the beauty inherent in a modern ecological approach. They take a practical, honest and frank approach, as well as being reliable and conducting themselves with integrity. Their comprehensive knowledge of costs and processes also allows them to guarantee the tightest budget controls throughout a project’s development. Time and finances are set aside to encourage staff to train as European Certified Passivhaus Planners and become experts in thermal modelling packages. Such investment has paid off with motivated staff sharing the same environmental concerns, clients delighted with the look and performance of their buildings, and an increased practice workload and improved business performance. bere:architects continue to drive the movement of Passivhaus forward through innovative design and education. The goal to be Zero Carbon Britain by 2050 may seem ambitious, but practices such as bere:architects make the green goals seem significantly more tangible. Passivhaus is a German approach, defined by the Passivhaus Institute, which demands a high level of insulation and a draught-free construction. It also requires a flow of fresh air and an efficient heat recovery ventilation system. This uses very little energy and saves a lot of energy that would otherwise go to waste. 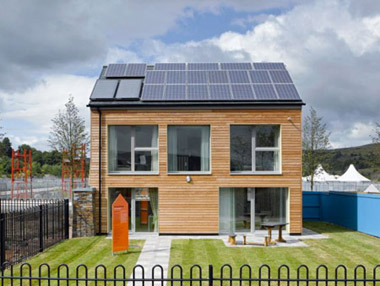 Designed by bere:architects, The Larch House, Ebbw Vale is the UK’s first certified Passivhaus, social housing prototype. The three-bedroomed house has been built 1,000ft above sea level in an exposed and misty hilltop location in Ebbw Vale, Wales. In spite of this, most energy needs are met by heat from the sun, occupants and appliances. Indeed the Larch House generates as much energy from the sun in the summer months, from solar thermal and photovoltaic panels (with an estimated feed-in tariff of over £1,300 a year) and glazing, as it uses for the whole year, making it Zero Carbon by UK definition. This house shows how we can live comfortably with minimal impact on the natural world.